← Has climate change slowed down? World-leading weather scientists from the University of Reading have been following the path of one of the biggest storms to hit the South of England for several years. High winds and heavy rain battered southern parts of the UK, causing travel disruption to Monday morning commuters. Here, some of our scientists explain what was going on. Dr Roger Brugge has been monitoring the situation at the University of Reading’s own atmospheric observatory. “There were some strong gusts of wind across Southern England, with gusts of up to 99mph on the Isle of Wight. Elsewhere strong gusts of 80mph appear to have brought down trees, causing travel problems for many commuters,” he said. 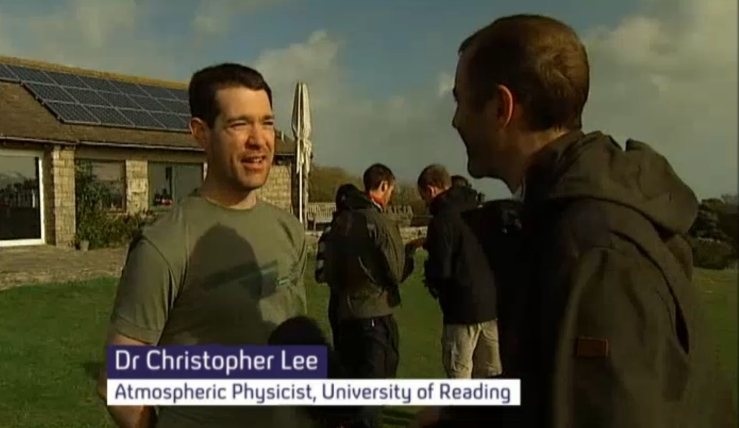 Over the weekend, Dr Rob Thompson & Dr Christopher Lee were interviewed by Channel 4 news during the MSc Dorset field course ‘Experiencing the weather’ where they launched weather balloons with the MSc students to watch the storm evolve. This entry was posted in Environmental hazards, Teaching & Learning, Weather. Bookmark the permalink.